Tom Parsons stretchered off today in Castlebar. MAYO MIDFIELDER TOM Parsons is set for a spell on the sidelines after suffering a serious leg injury in today’s Connacht quarter-final in Castlebar. 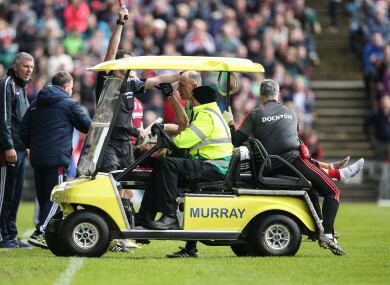 Parsons was stretchered off in the 47th minute of Mayo’s game against Galway, the injury occurring after he challenged for possession with Tribesmen defender Eoghan Kerin. “He has a knee dislocation but I am not sure of the extent,” revealed Mayo boss Stephen Rochford after the match. There was a lengthy stoppage in play as Parsons received treatment from the Mayo team medics before he was wheeled off the pitch. The loss to the Charlestown club man was a major blow for Mayo as he had been one of their more impressive performers and had chipped in with a fine point moments before he was taken off. 30-year-old Parsons has become a regular in the Mayo team in recent seasons. He first linked up with the Mayo senior panel in 2008 and after being released from the squad in 2011, he ended up moving to Cardiff the following year for work. Parsons commuted home from Wales for two years to line out for his club and his form saw him drafted back into the Mayo camp, where he has become a key figure in the squad that has contested the last two All-Ireland senior finals. Email “'He has a knee dislocation' - major injury setback for Mayo midfielder Parsons”. Feedback on “'He has a knee dislocation' - major injury setback for Mayo midfielder Parsons”.